When you are feeling pressure, there is a lot of noise around you and you find it hard to catch your breath. When you are hard on yourself and feel you are missing out. Have a look at your To Do List and ask is it really working for you, or are you doing for the sake of doing? After a weekend of intense self development with Authentic Education, great content and time well spent. There were many take aways for me. Yet, the one message in my head when I woke up this morning was TIME IS MONEY. Time is a resource that you can kid yourself to think is infinite. I put off, put aside, wait another day, get stuck, get off track, get busy panic and then, say - oh **** there it is not enough time. Time is finite and it is guaranteed you will eventually run out of time. When TIME IS MONEY keeps repeating in my head, I know it is important for me to sit up, listen and learn. When it comes to money, it is important to me, I can buy things, I can amplify my life, money gives me greater freedom and I could list 100 reasons why money is important to me. Time is my best asset and yet do I value time? Are the systems that I have and the planning that I do making the best use of my time? Does the way I value time reflect on how much I value myself? I wrote down 3 ways to value my time and the decisions I make..here they are. Three ways to value my time. 1. The time spent in the beginning, when planning and organising my life, my goals and my day is the best and biggest investment. The management of my time, my decisions, my life has results and I make time. 2. Look at what is not working for me and replace with a better way. The average person looks at emails 38% of their day, put an hourly rate on that and you will see it is way too expensive. If you look at time as money, then you are burning dollars in front of your face. When I put systems in place, use shortcuts, reduce double handling in my daily routine, I save time. 3. Be alert to the traps that want to take your time. Traps like phone tag, serial web surfer, social media junkie, procrastination, saying yes when you mean no ( in terms of your time), keep losing items and searching, people who don't value your time and more. Traps take your time. The detail on the "how to " strategies are definitely more than one blog post can handle. Just by doing this one thing, knowing that my time is valuable sets me on a path of decision making to better management, system tips to put in place and backing away from the traps. 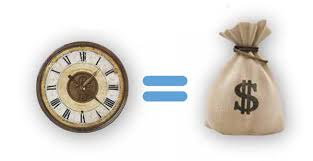 When you view time is money and you view time as valuable, you will make decisions that are important for you and it will show up in your self worth, your efficiency and productivity. I am curious, what are your thoughts on how you value time? In comes the new year and a great reminder to us to look at a habit upgrade, set our goals and get our lives into shape. It is also a good time to unclutter and toss out something that is getting in the way, holding you back and really of no use to you anymore. One to toss out is the beliefs you hold as true yet they are getting in your way and a big one is the truth you hold about your self belief and self worth. What do I believe to be true, that isn't? You can create all the great goals and ambitions you have for your life, but if in the background your belief that you are not worth having what you desire, or not smart enough, or not creative enough then those beliefs will cause some serious interference with making it happen for you. I had some life choking beliefs and now looking back, I feel a bit ridiculous to be so limiting of myself and how they coloured my world. I believed I wasn't smart enough, I would just make do with low paying work and just get by. I believed I made wrong choices and I wouldn't find a wonderful partner and share so much together. I believed I would always struggle for money and never have the wealth to own a home and to travel. Just a few of the beliefs that were holding me back, that are not true, a belief trap I had created and accepted. Once you know your belief trap, you can do something about it. I saw them for what they were as false, I made the decision and created beliefs that work for me. Positive beliefs about me being capable and creative, about making great choices for my life and having the direction and focus to unlock my best future. 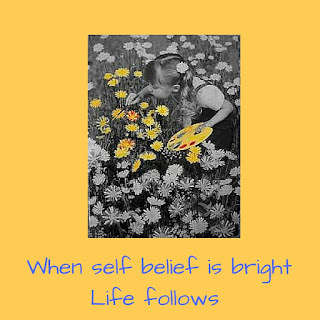 A positive self belief is a necessary health factor in life. A positive self belief is key for making your goals happen. Do you believe "your self image fundamentally provides your brain with direction"? Psycho Cybernetics" (1960) by Maxwell Maltz. The more grounded you are in a healthy self belief the more it will result in a positive impact on your life, the people you love and your community. Somewhere in life you picked up worn out, constricting, narrow beliefs. 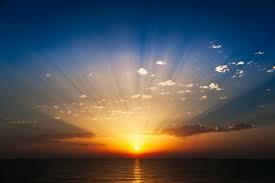 Toss out those old beliefs and replace them with new shiny wonderful heart rejoicing vibrant life giving beliefs. Best wishes for 2016. I am certain you had an amazing time over the new year holiday. I am also certain you are all set to maximize 2016. What better way than setting your sights on changing things up for yourself and to be in a position where life is not happening to you, but it is happening for you. You are investing time on setting out to design your life and the new year is a great place to begin. There is some great advice out there, and let’s face it a lot of us who start off with a big plan and good intentions make it to the 2nd week of January and it all falls in a heap. They have even done research on this very topic with university studies showing results only 8% of those who set these goals and resolutions make it through the first month and that means the majority - 92% give up. We have good intentions, we want to make these decisions stick, we set up these goals because we want better but for a lot of us, it all unravels and we have many excuses to tell to justify why it happens. When it comes to how to design your life you are making big decisions that involve risk, commitment and being prepared to move out of your comfort zone. There is no silver bullet, no click your heels, close your eyes and make 3 wishes it will all come together, neither is there one size or one process that fits all. If you are ready to max out 2016 its time to start exercising your goal getting muscles. 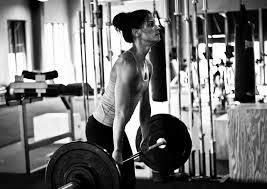 I have put together just 3 exercises to build your goal getting muscles. No 1. Expect there will be emotions, like fear and anxiety. When you know what to expect, you can challenge the thoughts and prepare. So prepare for anxiety, it will come -it is only natural. What will stop it in its tracks, is action. You have set out some amazing audacious goals for the coming year. Your goals are really going to move you out of your comfort zone. The zone is called comfort for a reason, it is comforting to know how you will act and react, there is that predictability with a certain amount of stretch but nothing that will cause you to be anxious. So when anxiety comes with something new and challenging you have the option of not going any further and anxiety wins or you can decide to act and you win. Anxiety can rob you of your strength and decisiveness. Anxiety will trap your energy, cause you to second guess or worse still, stop you moving towards what you were after in the first place. When you make big goals and have put a plan in place, take it as part of the journey that anxiety is natural and expected. Keep your promise and make the decision necessary for that goal to happen. You know it is not comfortable, but it will pass and the great thing is you are on the way of expanding what is comfortable for you. So, even when there is this pit of anxiety in your gut, you still need to follow through on your decisions. This is not the time to retreat. “Decisions shape your life, not conditions” Tony Robbins. No. 2 Have a game plan and prepare to kick between the goal posts. You can view your goals like a game plan and like a game plan, your goals need to be clear on what they are, what they look like and what it will be like when you can say, yes I achieved that goal, the goal I set out to do. When you play the game by your rules, you are setting yourself up to win. The rules that you make for yourself, that you know you can achieve with effort and self control will be the game changer for goal getting. So what rules will you set for yourself to kick the goals and win your game? ‘Great things are not done by impulse, but by a series of small things brought together”. You have made the decision to make a change, you are creating a new game plan for your best life and are ready to kick some goals that will bring about something wonderful for you. It is exciting, you are excited and your energy and enthusiasm is high. Ok, then it is getting harder to maintain and by Day 4 the momentum starts to fade, the focus now may not be so clear and the goal you were so keen on is fading. Your daily routine is going to make all the difference now. You strengthen your goal getting muscles through daily routine and creating the day that will be of service to you to achieve your goals. Be creative in your daily, weekly and monthly practises as these will be the steps towards making the big goals happen. Here are 10 ideas for you to try out. Jolly Jar – Drop a short note in your jar every day. Your note can be about what you are thankful for, what was good about the day, or anything about what you want to achieve. At the end of the month, kick back and read through the notes to yourself. It is an easy thing to do and after 366 days what a gift you have given yourself. Picture boards or pin interest help to turn your goals into something visual and detailed. You can add, explore more ideas, stretch your thinking. It is a great creative way to see your goals come alive. Mirror Talk – You are what you see in the mirror. Mirror talk feels strange at first but you have to start somewhere. In the morning routine remind yourself what these goals mean to you. The night before. This one is about being organised. You want to exercise every morning? Then set up your clothes and equipment the night before, put them where you can’t ignore them. This also helps with priorities, write your top 3 for the next day, think about them before you go to sleep and in the morning you are ready to make it happen. Keep statistics. Keep your incentives where you can see them. You can use a board, a flip chart, a calendar and write up your wins for the week. Looking back helps with seeing how far you have come and your future priorities. Write a letter to yourself and mail it. Keep the thrills coming and send yourself a letter from your future. This gives your goals some perspective on how it all turns out. 1x5x5 . Take one goal and to achieve it make 5 actions and for each of the 5 actions have 5 steps. This is detailed, micro work and it gets you into action. Turn the negative to a positive. It just slips out of our mouth. Things like “I hate Mondays”, “This is too hard”, “I will die, if I have to do that”. They sound terrible? Right?. Watch what you say, catch what you say and turn it around to a positive statement. It all starts from the inside, your thoughts, your beliefs show up in your words and in your actions. If you believe you can’t do it, then you can’t. Some people call them a swear jar, but you could throw those negative words into a jar with a few dollars. One more try. What is the difference between succeeding in what you have designed in your goals and giving up? One more try. There is much to read about strengthening your persistence, commitment and determination. The authors’ wisdom can be of great encouragement, put it into action and build these attributes by giving it one more try. You missed doing something one day, get up the next day and give it one more try.